This is probably the most slippery snake you are ever likely to encounter! 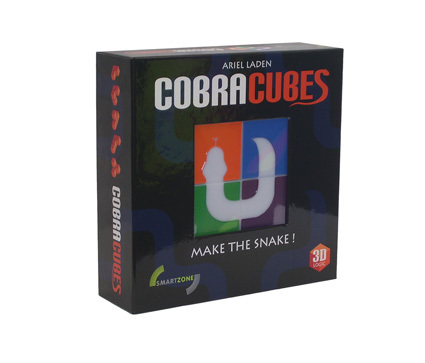 This addictive 3D puzzle has a simple premise – create combinations of the 4 cubes to form a snake. The catch – your cunning cobra must include all parts of the snake (head, body and tail) in the correct order. With dozens of different challenges at various levels of difficulty, your spatial reasoning and logic skills will be stretched to the limit. 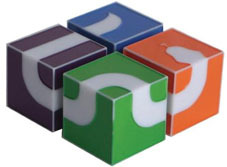 Younger children can also use the cubes in a free play format to build their own version of a snake. Ages: 5 years +, 1 (single) player. Enjoy some fun family times together for ages 5 to 105! A beautifully presented game - the perfect gift for Kiwis at home and overseas! If you would like to order Cobra Cubes direct, please click on the icon. For bulk pricing options, please contact us with details of your request.